As always be mindful of your surroundings. Don't select an ATM at the corner of a building - corners create a blind spot. Do your automated banking in a public, well-lighted, high traffic locations that is free of shrubbery and decorative partitions or dividers. Maintain an awareness of your surroundings throughout the entire transaction. Be wary of people trying to help you with ATM transactions. Be aware of anyone sitting in a parked car nearby. When leaving an ATM make sure you are not being followed. If you are followed or think you are, drive immediately to a police or fire station, or to a crowded, well-lighted location or business. If lights around the ATM are not working, don't use that machine. Do not use an ATM that appears unusual looking or offers options with which you are not familiar or comfortable. There are machines that thieves stick on top of ATM machines called skimmers that steal your banking information. When using a walk-up ATM, park as close as you can to the machine. Before leaving the safety of your car, check for suspicious persons or circumstances. Have your ATM card ready before you approach the machine. Shimming is when a criminal inserts a shim ( a card-sized device with an embedded microchip and flash storage) into the slot where you enter the chip side of your credit or debit cart. When you insert your card it copies and saves your payment information, such as your PIN and card number. Criminals then use this information to make purchases with your account information. Keep a close eye on your bank and credit accounts. Check your online statements regularly to make sure there are no suspicious charges. If you see any, report them to your bank or credit card company immediately. Use the customer service number on the back of the card to be sure you are reaching the real company and not an imposter. Make sure you contact the bank, merchant and your card issuer if you ever suspect your card has been compromised. Be wary if your card gets stuck in a chip reader. If the reader seems to have a tighter than normal grip on your card, there could be a shim inside. You may want to cancel your transaction and notify the business. Use contactless payment methods. Contactless payment methods are not vulnerable to shimming. Try using "tap-and-go" features on your credit card instead of swiping or inserting your card. You can also use contactless mobile services such as Apple Pay or Samsung Pay to tap and pay. Go inside to a teller to withdraw cash at a bank. ATMs and gas stations — especially in tourist areas — may have skimming devices. 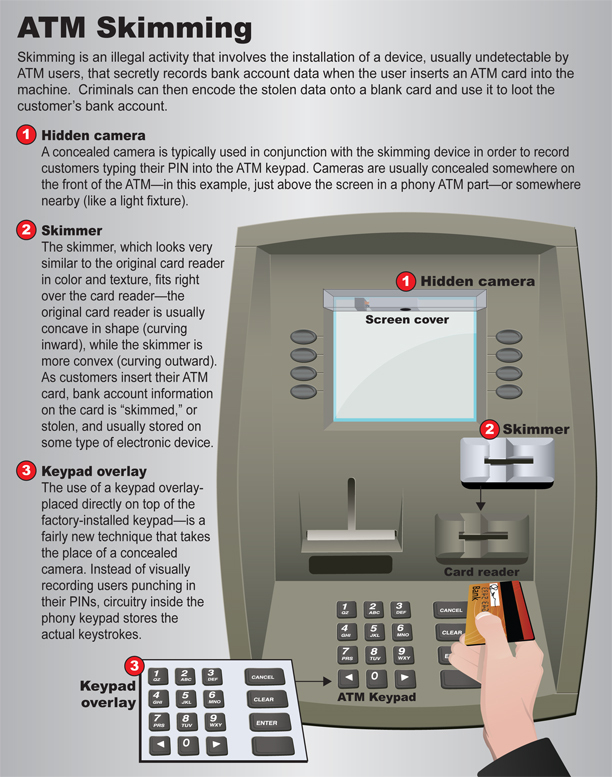 Scammers use cameras, keypad overlays, and skimming devices — like a realistic-looking card reader placed over the factory-installed card reader on an ATM or gas pump — to capture the information from your card’s magnetic strip without your knowledge and get your PIN. Be careful of ATMs in tourist areas…they are a popular target of skimmers. You may be able to turn your cards "on" and "off" from your phone. If you suspect your card has been skimmed, you can use the app on your phone to turn the card "off," a setting that denies any requests to use your card. Once the suspicion has passed, if no fraud occurred, you can use the app to turn the card back "on." This type of switching feature often includes some flexibility. You might turn off the card for online purchases but keep it open for stores. You might also turn the card 'on" for all transactions except ATMs. Ask your financial institution about pairing geolocation software with your card. This type of feature tracks the location of both your card and phone. When someone attempts a transaction, the card company compares the location of the phone with where the card is being used. If it matches it will let the transaction go through. If the card and phone locations don't match, the card company denies the transaction. This way, if someone steals your card or card information, it would be difficult to make a purchase. Keep a close eye on your credit card statement for purchases you didn't make. Consider monitoring your checking account transactions daily on your financial institution's website. Consider using a notification service. If you put a threshold on your credit or debit card when using such a service, you will get an alert if someone charges something over that amount. For instance, if you set a limit of $1,000, you'll be notified if someone attempts to spend $1,500 with the card. Typically, under the account services tab, you'll be able to change the notifications. Most financial institutions and credit card issuers offer this feature, but if you don't see it, contact the financial institution and ask if notifications can be set up. Ask for a "card not present transaction" notification. If someone tries to use your credit or debit card number online, you'll be notified immediately.